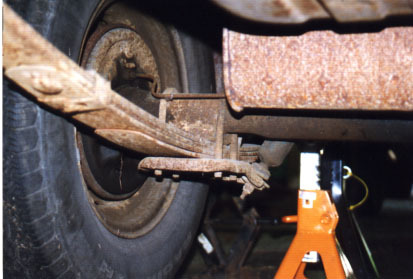 One of the first things that needed fixing was the suspension. It was full of the usual squeaks and rust. The project took place in our carport during several weekends in April 1997. 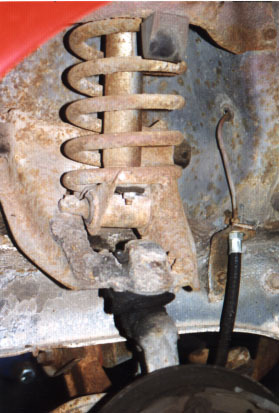 The front was riding about 1.5 inches too high after this (and no, it wasn't the springs, as it rode high even with the originals). 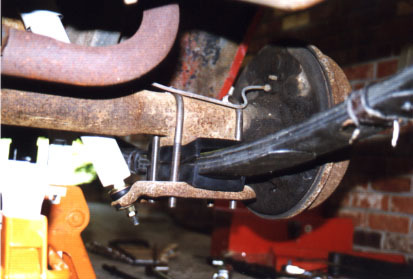 I ended up taking to too a shop which agreed that I had done the job right, and suggested cutting part of a coil off to compensate. I broke the rental spring compressor (!!!) just as I was finishing up. 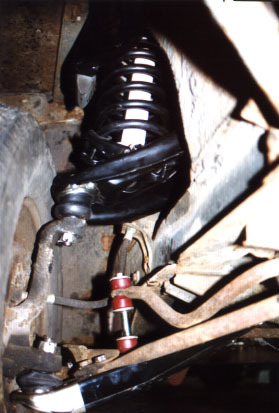 Rear suspension after (I ended up taking the black-rubber blocks out from around the springs a few months later after determining that they didn't belong on the Mustang).